OK, so I’m no fan of the Golden Globes, but I AM a fan of movies. You all probably know that by now due to my incessant need to reference Star Wars A LOT and my obscure movie references throughout my articles, apparently only for my own personal amusement. But just this once, I’m going to reference the Golden Globes, which thankfully distracted me after the ridiculous whooping the Packers gave the Giants on Sunday. At any rate, my favorite part of the Golden Globes had to do with Emma Stone, whom you all might remember as Jules from “Superbad”, Olive from “Easy A”, Gwen Stacy from “The Amazing Spiderman” or Heather from that one episode of “iCarly” 5 years ago. Or so I’ve heard. I’ve never actually watched “iCarly” on Nickelodeon. OK, maybe I once watched part of an episode because…um…well…talking about awkward situations, did you see what Emma Stone did at the Golden Globes? In her zeal to congratulate “La La Land” director Damien Chazelle for winning Best Original Screenplay, Stone jumped up and attempted to go in for a hug at the exact same moment Chazelle was going to kiss his girlfriend Olivia Hamilton. In typical Emma Stone fashion, because this is exactly how I would expect every character played by Emma Stone to react, she immediately backed off after the awkward “double hug” and said “That’s weird. I’m sorry!” Well played, Ms. Stone, well played. That’s total grace under pressure. Something I wish the Giants had when playing the Packers this past weekend, and something I wish OBJ had after the they lost the game. At any rate, the reason I bring this up is that sometimes people get put in tough situations where they make mistakes. But just as important as correcting the mistake is how they react to them. 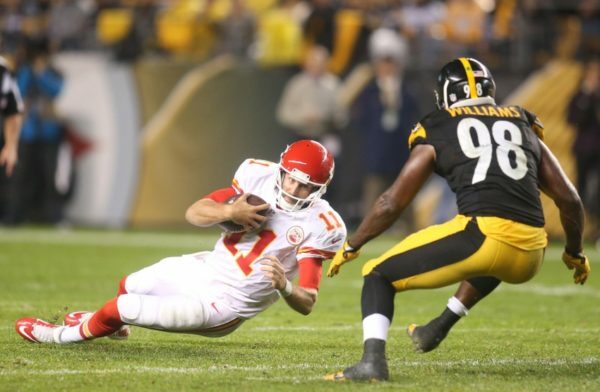 The Chiefs committed huge mistakes in their first meeting with the Steelers earlier this year. They reacted by winning enough games to lock up the No. 2 seed and a first round playoff bye. But was it enough to avoid the same mistakes in the AFC Divisional Playoffs? UPDATE – The Steelers @ Chiefs game has been moved to 8:20 PM ET due to weather. 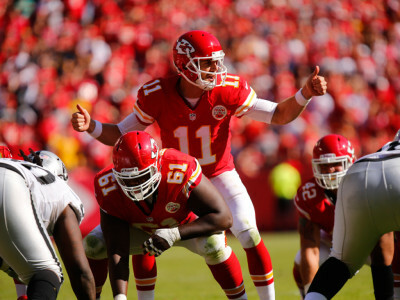 The Over/Under has also been updated to 44.5 and the Chiefs are now favored by 1.5. Without even having played a single game in the postseason, the Kansas City Chiefs have already accomplished quite a bit. They’ve managed to secure their first AFC West title since 2010 and their first playoff bye-week since 2003. But it all won’t matter if they don’t win the Super Bowl. And it certainly has been awhile. In fact, the Chiefs haven’t been in the Super Bowl since Super Bowl IV in 1970. And that’s been their only Super Bowl win to date. The Steelers, on the other hand, have won the Super Bowl a whopping 6 times. This includes 4 times from 1975 to 1980 and most recently in 2006 and 2009. And Big Ben was there for two of them. In fact, Ben’s 2006 win also got him in the record books as the youngest QB to ever win a Super Bowl. But, although this is kinda old hat for the Steelers, its no less of a big deal. 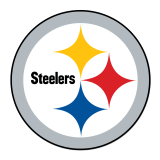 The Steelers took care of business avenging their regular season loss to the Miami Dolphins in a big way in the Wild Card game. But now they go to Arrowhead to face a well rested, and mostly healthy, Chiefs team. As I mentioned, the Chiefs committed a bunch of mistake in their first meeting with the Steelers this year. The Steelers destroyed the Chiefs at home, 43 to 14, in Week 4 on the back of Ben Roethlisberger’s 5 TD passes. It was also Le’Veon Bell’s first game back from a 3 game suspension, and he made the most of it with 178 total yards of offense. In fact, it was such a dominant performance that the Steelers were actually winning 36 to 0 into the fourth quarter. It ended up being the worst loss of the Chiefs season, and the worst loss of Andy Reid’s tenure as head coach in Kansas City. Turnovers early in the game were the difference. 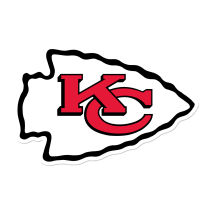 Two turnovers by Kansas City within the first 10 minutes of the game, a fumble by Spencer Ware and an INT by Alex Smith, were converted into Pittsburgh TDs plus a 2-point conversion. That, and a missed FG by Kansas City at the end of the first half, essentially set the tone for the rest of the game. At the end of the 3rd Quarter, down 0-36, the Chiefs put together their best drive of the game, going 80 yards to the Pittsburgh 3-yard line before turning the ball over on downs. If you think about it, if you take out the 15 points due to turnovers at the beginning of the game, and say that the Chiefs actually converted the 44-yard field goal in the first half and the TD from the Steelers’ 3-yard line in the 3rd quarter, the final score COULD have been 24-28. But, as they say, “would-a, could-a, should-a, didn’t”. It was a dominant performance by the Steelers, but it was long time ago now. Remember, two weeks after this, the Steelers managed to lose to the Dolphins 30 to 14, where Roethlisberger had his lowest QBR of the season (4.1). Clearly, both the Steelers and Dolphins looked nothing like what they both did in Week 6 when they played in this past weekend’s Wild Card game. So the question remains, can the Steelers beat the Chiefs again in the playoffs? Round 2 – “Superbad” or “La La Land”? 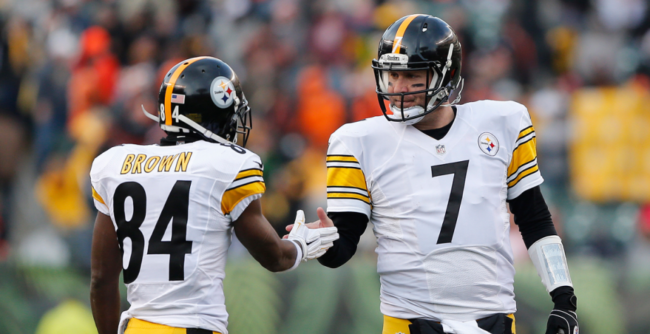 At end of the regular season, even without playing in Week 17, Roethlisberger had the 5th most passing TDs per game (2.1), Brown had the 4th most receiving yards per game (85.6), 2nd most receiving TDs per game (0.8) and most receptions per game (7.1) and Bell had 2nd most rush yards per game (105.7), most carries per game (21.8), 2nd most receiving yards for a RB per game (51.3), and most receptions for a RB per game (6.1) in the NFL. In fact, Bell became the 1st player in NFL history to average at least 100 rushing and 50 receiving yards per game in a season. But it’s not just those guys, it’s the entire Steelers offense that’s hot. In fact, the Steelers average the 7th most offensive yards per game (372.6), have the 4th best rushing offense and the 8th best passing offense per Football Outsiders DVOA. And a major reason for this is the offensive line, which is the 4th best in pass protection per Adjusted Sack Rate (sacks plus intentional grounding penalties per pass attempt adjusted for down, distance, and opponent), allowing the second least sacks in the NFL (21), and the 4th best at run blocking, with only 15 percent of runs where the RB is tackled at or behind the line of scrimmage. And in the first playoff game in which all three of Ben, Bell and Brown played together, they all managed to do what they do best — dominate. Big Ben wasn’t asked to do much as Antonio Brown quickly took two to the house in the first quarter (becoming only the 4th player in Steelers history to catch 2 TDs in a playoff game), and the rest of the game was essentially Le’Veon Bell running all over the Miami defense totalling 167 rush yards and 2 TDs. Everything the Steelers were doing in the regular season rolled directly into the playoffs without skipping a beat. But playing at Arrowhead against the Chiefs is not the same as playing the Dolphins at home. And most everyone is aware of Roethlisberger striking home/road splits, in that he’s much less effective on the road. In fact, check out these 2016 splits for home and away. And this is not unique to 2016, as Roethlisberger has had similar splits in 2015 as well. Whether it has to do with field conditions, weather, fan support, comfort level or something more psychological is unclear. But what is clear is that Ben is not the same QB on the road as he is at home. Clearly, job one for the Chiefs will be containing those responsible for the Week 4 regular season beat-down, including Big Ben and Antonio Brown. Fortunately, the Chiefs pass defense has steadily improved throughout the season and ended 7th best per DVOA on Football Outsiders. Part of this success is due to a strong pass rush, led by Justin Houston. And he’ll be back and ready to go this weekend against the Steelers. This is incredibly important in light of the fact that Roethlisberger tends to suffer under blitz pressure, with his passer rating dropping to 69.0 against the blitz as compare to 95.4 when facing non-blitz scenarios. But another reason for this success is a solid secondary lead by Eric Berry, Ron Parker and Marcus Peters. Sure, Ben lit them up in Week 4, but the Chiefs have sorted out their pass defense in the meantime, allowing just 221.4 passing yards per game to opposing QBs over the final five weeks of the season. Berry has been one of the best coverage players in the NFL this season, grading out at number 7 per Pro Football Focus. Parker leads all safeties with 8 pass breakups, and Peters’ 17 combined INTs and pass breakups are 2nd best among cornerbacks. Of course, that group of three doesn’t tell the entire story, as Phillip Gaines was the 2nd lowest graded corner in coverage this year. Plus, the Chiefs are 19th against WR1s and 20th against TEs per Football Outsiders. Doesn’t bode well with respect to containing Brown, or either of Jesse James or Ladarius Green. Fortunately, the Chiefs are top 6 defending every other receiving position including RB targets, which does bode well for containing the most prolific receiving RB in the league, Le’Veon Bell. Unfortunately, the Chiefs are ranked just 26th against the run per DVOA. But although the Chiefs allow the 9th most yards per game (368.5), they actually allow the 7th least points per game (19.4). And if you look at it from a per drive perspective, the Chiefs allow the 9th most yards allowed per drive (33.67), but, again, the 8th least points allowed per drive (1.76). So the sub par rush defense stats may be a bit misleading, as although they might get run on, they don’t allow many teams to capitalize on all those yards. And although they employ a “bend-don’t-break” defense, the Chiefs still manage the 5th best average starting position per drive (30.39). So they’re still getting defensive stops when it counts and getting the ball back in good position. On the other side of the ball, the Chiefs have the 10th best pass offense per DVOA. But it’s not built on prolific production, but rather conservative production. They’re tied for the 6th least passing TDs in the NFL this season (19), but also tied for the 5th least INTs (8). Alex Smith is a game manager, but not in the negative sense of the word. He’s been aggressive when necessary, but otherwise takes what the defense gives him. And Smith can afford to be conservative, because he has two dynamic weapons in Travis Kelce and Tyreek Hill, each of which can change the game in one play. Kelce is ranked 1st among TEs according to DYAR (Defense-adjusted Yards Above Replacement). In other words, there’s no other TE in the NFL that can competently replace him on the field catching the ball. So it’s no surprise that Kelce also has the most receiving yards of any TE (1125), the 2nd most receptions of any TE (85), and 4 TDs on the season. Tyreek Hill essentially does it all. He catches the ball, runs the ball and returns kicks and punts. Basically, every time he touches the ball he’s a threat to score. In fact, Hill is ranked first in DYAR for WR rushes with 267 yards and 3 TDs. Congrats to Chiefs rookie Tyreek Hill (@ImFasterThanYa) for being named to PFF's All-Pro team. And speaking of kick and punt returns, the Chiefs have the 2nd best Special Teams per DVOA in the NFL. Hill is a big part of that with the most average yards per punt return (15.2) and the most punts returned for TDs this season (2). Another big part of it is kicker Cairo Santos who has the 5th best FG % in the NFL (88.6), hitting the most FG’s between 30-39 yards (15) and having a long this season of 54. But wait, you ask, what about the Chiefs ground game? Well, without Jamaal Charles, and with a on-again-off-again Spencer Ware, the Chiefs have just the 20th best rush offense per DVOA. 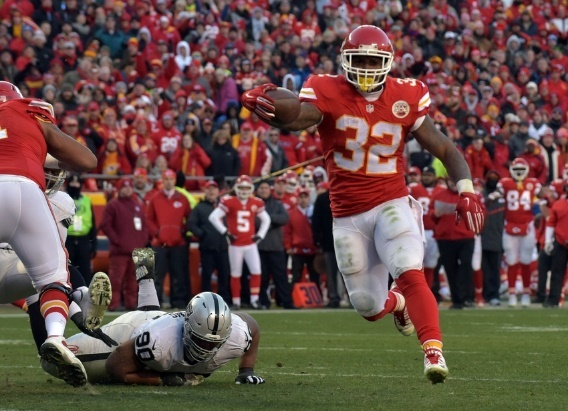 But Spencer Ware is fully healthy after the bye week and the Chiefs do have the 13th most rushing TDs (15) this season. Plus, although not traditionally thought of as a dual threat, Alex Smith is tied for the second most rushing TDs by a QB (5) this season. Perhaps most interesting to note about the Chiefs offense is its ability to play ball control. Because what better way to neutralize a dangerous and dynamic offense than to keep them on the sidelines? The Chiefs have the 4th slowest pace of play with 28.71 seconds per play as compare to a league average of 27.57. They also have the 4th highest time of possession when leading. And the Chiefs have the best take-away / give-away (INTs plus fumbles) differential in the NFL (16). Specifically, they have the most take-aways in the NFL (33), while being tied for 6th least give-aways (17). So all in all, the Chiefs protect the ball, don’t take chances, are opportunistic and will milk the clock away with a win before you know what hit you. The Steelers have adjusted their defense to account for the lost of Cam Heyward, and a significant part of their current success is due to 2nd round 2014 draft pick, Stephon Tuitt. In fact, Tuitt was named AFC Defensive Player of Week 11 with his 6 tackles and 2.5 sacks against the Browns. The Steelers are tied for the 7th most sacks (38) for the 7th most lost yards (259) and are tied for allowing the 5th least passing TDs (20) this season. And on the ground, the Steelers have the 9th best rush defense per DVOA in the NFL. Plus, the Chiefs have the 3rd worst points per redzone appearance (4.33) and 3rd worst TDs per redzone appearance (.455). Although Hill and Kelce can score from outside the redzone, it will be tough for the Chiefs to improve this stat against the Steelers. Turnovers. If the Chiefs want to win, they have to avoid critical turnovers like they did in Week 4 and capitalize on take-aways. Ball Control. The best way to stop Big Ben from throwing 5 TDs is to keep him on the sidelines. Special Teams. Starting field position will be important to both teams, but more so for the Chiefs, who don’t have consistent chain moving options like the Steelers. Le’Veon Bell. It’s that simple. The Chiefs primary weakness on defense is against the run, and Bell is the best in the business. Tyreek Hill. He’s the X-Factor. It only takes one play. Will “Home” or “Away” Ben show up? If “Away” Ben shows up, the Steelers defense will need to play tight to avoid having the opportunistic Chiefs take advantage. The Chiefs exact revenge after the worst defeat they’ve had in four years and manage to contain the Steelers high powered offense. Chiefs win and cover the spread. This article is “Emma Stone Approved.” By which I mean if I saw Emma Stone, I would expect she would give me the thumbs up, assuming she confused me for someone she actually knew. Maybe.